Dedicated to their clients, whether they want to buy or sell a home along North Carolina’s coast, the Michelle Clark Team looks forward to going the extra mile. 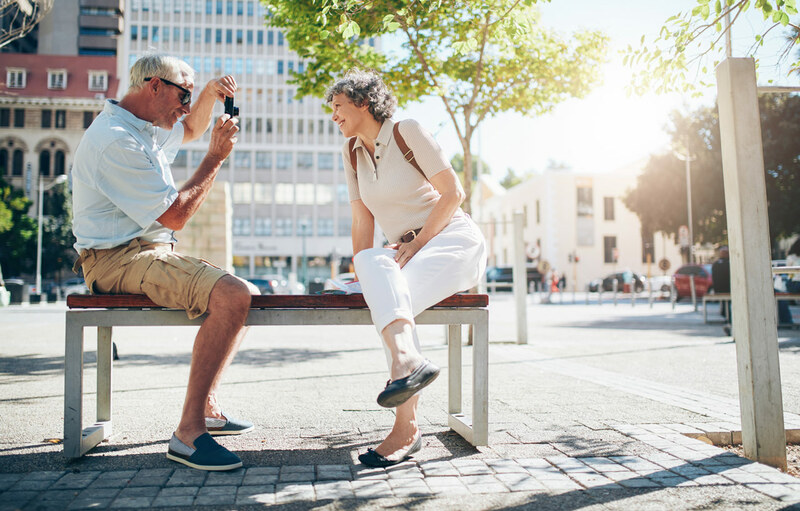 The positive experience doesn’t end once the final paperwork has been signed – the team prides itself on establishing lasting community relationships as well as settling residents in their ideal home. Using their combined experience, each member of the Michelle Clark Team brings enthusiasm and local expertise to the process of buying or selling of a home. That passion for their work is something these real estate agents share with Sage Island’s crew. 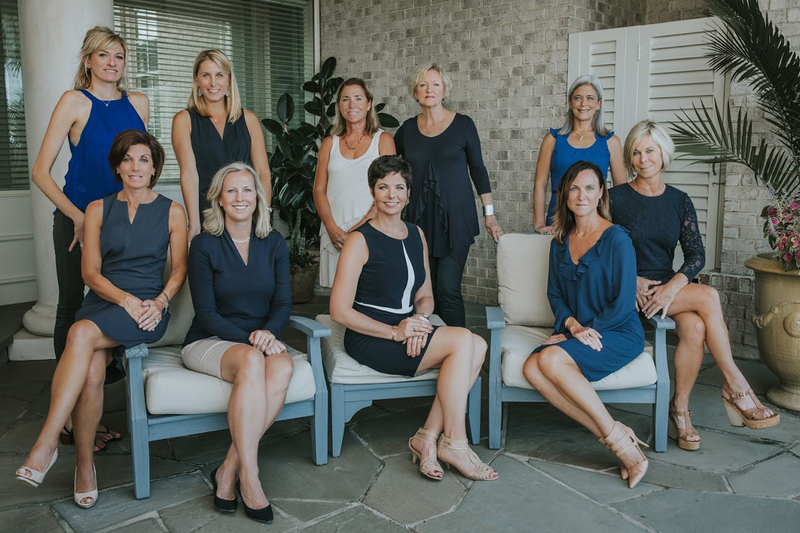 Though coastal North Carolina is well-known for a variety of real estate agencies and plenty of competition on the market, the Michelle Clark Team holds its own. Thanks to the team’s personalized approach to every case, it’s earned the reputation of being a reliable and friendly resource to the community. But to push the agents even further ahead in the real estate industry, they knew they would need to keep improving. We helped them with an updated website, as well as innovative ideas in their print advertisements. In doing so, the team would be able to move forward without losing any of its hard-won ground as a neighborly resource. The first step to rebranding Michelle Clark Team’s image was to address any outdated pieces of the existing website and alter or replace them as needed. The goal was to give the pages a fresh look, without losing the familiarity enjoyed by the team’s past clients. 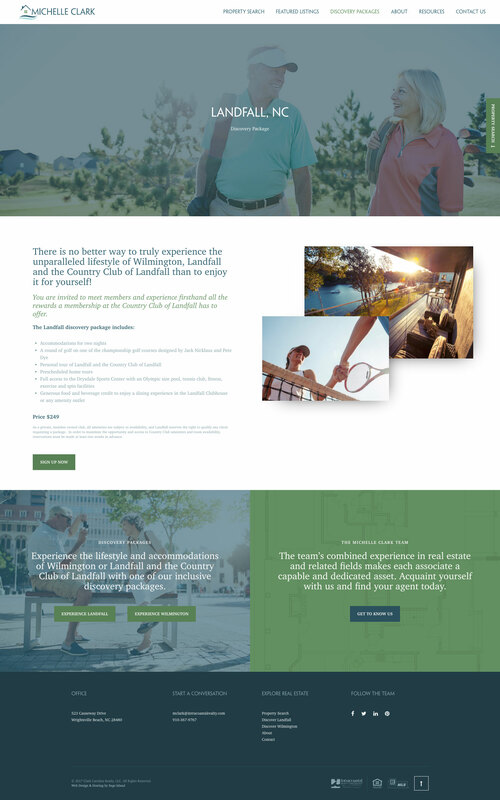 Because it is so involved in their communities and with the homeowners it serves, the Michelle Clark Team needed a website that was both professional and personal. 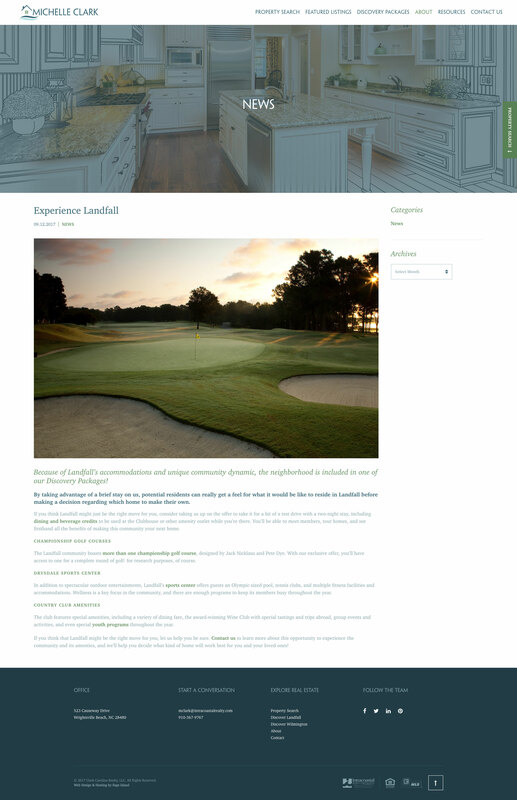 The first changes we made to the site involved a new color scheme, in fitting with the relaxed coastal vibes that go hand-in-hand with the team’s approach to real estate. Since it boasts friendly and approachable agents dedicated to helping new residents as well as those looking to sell a home, the overall approach needed to be engaging without overwhelming. To do all of this, we also incorporated new content to many of the pages to showcase the team’s local knowledge and introduce the individual agents. This included new information for areas that the team serves and details on what potential clients can enjoy when they decided to take advantage of a Discovery Package. Additionally, we were able to expound upon new neighborhoods in specialized areas of the website, highlight testimonials, and incorporate a blog to enhance the team’s credibility as a whole. 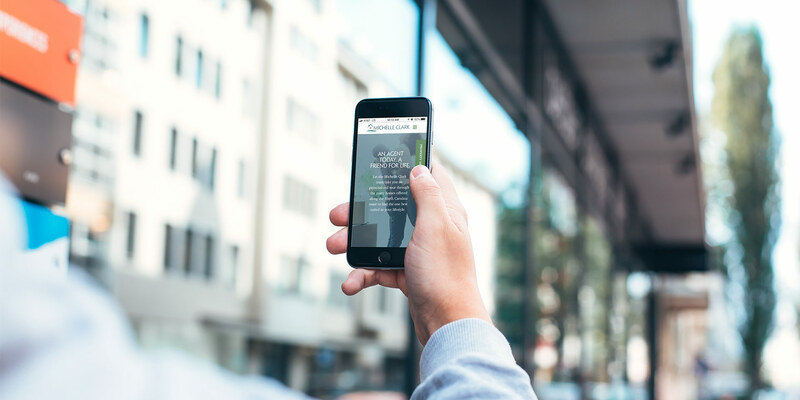 Finally, we drew the Michelle Clark Team further into the digitally-dominated realm of marketing by enabling features that make the site more responsive. This means that it’s now able to be searched and examined via mobile devices, whereas a lot of their previous website’s information was lost during those searches. After launching Michelle Clark Team’s newly branded website, we extended that branding to a print advertising campaign. 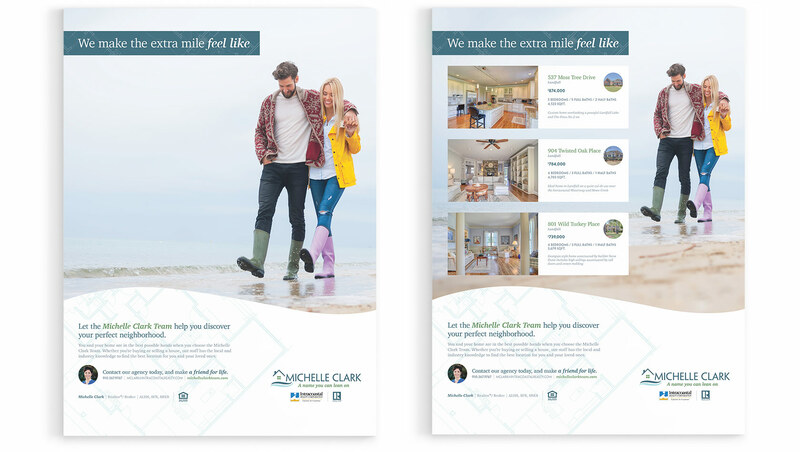 Michelle Clark Team has been running individual ads in local publications for years, but to build the client’s distinct brand we developed a cohesive campaign that matched the website’s tone, color palette and messaging. We started with Michelle Clark Team’s new tagline—“An agent today, a friend for life”—and created a campaign concept that could run throughout the year with simple updates to reflect seasonal considerations. We gave our working campaign line—“We make the extra mile feel like a walk in the park”–a creative twist by dropping “a walk in the park” and instead using lifestyle-centric imagery to convey that carefree mindset. Once we developed our campaign concept, we created executions to meet Michelle Clark Team’s two main goals: advertising property listings and creating brand awareness. Both versions had clear call-to-actions directing readers to contact the client through email or by phone and both were branded through consistent copywriting and use of the Michelle Clark logo colors, typefaces and graphics. The website and ad campaign together give the client a clear identity in Wilmington’s competitive real estate market. Our team continues to monitor the results, but we expect that our cohesive branding and goal-oriented marketing deliverables will translate into more business for Michelle Clark Team.